Stress, depression and anxiety disorders are the modern day plagues. If you suffer from anxiety, depression, panic attacks, nervousness or you have a feeling of sadness which just won’t go away, you’re not alone. Over 40 million US citizens will be affected every year. The millions of costly antidepressants that are prescribed each year may only temporarily suppress some of the symptoms and can produce disabling side effects. "Psychotropic drugs are not the answer to the critical and growing problem of depression in this country. In fact, I believe that in some ways they contribute to it." Michael B. Schachter, M.D. Psychotropic drugs act on the mind, and change brain function that results in alterations in perception, mood, or consciousness. Physical dependency and harmful side effects may also accompany psychotropic drug use. Chronic stress is at epidemic levels in the western world. The World Health Organization estimates that stress-related disorders affect nearly 450 million individuals worldwide. Millions of people suffer from health complications linked to chronic stress and more than half of all patients visiting their doctor complain of stress-related fatigue. In 2011, in the United States, nearly 75 million unique prescriptions were written for Xanax and Ativan, two anti-anxiety medications. Linda Page, N.D. Ph.D. "The stress-disease connection is today's norm; the result of every day stressors like air pollutants, toxic reactions to metals or chemical halogens like chlorine and fluoride, chronic low-grade, but debilitating infections, parasite invasions, allergies and sensitivities to today's foods and of course, strong emotional reactions." There is increasing evidence that diet may play a causative role in cases of depression. The food production in industrialized societies uses intensive farming and processing techniques. This can contribute to depleted levels of magnesium, omega 3 fatty acids, certain amino acids and other essential nutrients in the food we eat. Dr Joan Larson, Ph.D believes that many doctors misdiagnose nutritional imbalances as psychological disorders. 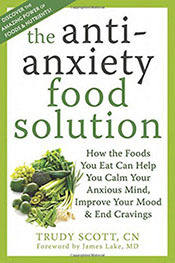 She argues that most people who are depressed, fatigued or addicted to food, cigarettes or alcohol suffer from a deficiency of vitamins or amino acids that is only exacerbated by drugs like Xanax, Prozac and lithium. Dr. Larson plausibly links biochemical emotional problems with the gradual shift in the American diet over the past 60 years toward sugary, carbohydrate-laden and processed foods, which disturb the body's insulin production and deprive the brain of much needed vitamins and nutrients. According to a study in ScienceDirect, there is a growing emphasis on the relationship between the complexity and diversity of the microorganisms that inhabit our gut (human gastrointestinal microbiota) and health/disease, including brain health and disorders of the central nervous system. The gastrointestinal microbiota has also emerged as a key regulator of centrally mediated events including stress and neuro-inflammation. Russell L. Blaylock, M.D - "It has been estimated that 14.8 million Americans suffer from major depressive disorder and of this number 6 million are elderly. If we include anxiety disorders, which commonly accompany depression, the number jumps to 40 million adults. At a cost of $44 billion dollars a year just for care of the seniors, this impacts the national budget as well." According to the World Health Organization (WHO), by 2030, the amount of disability and life lost as a result of depression will be greater than that resulting from any other condition, including accidents, war, suicide, cancer, and stroke. Depression removes all the joy from people's lives, leaves them unable to function and causes their family and friends much distress. What’s even worse is they are told the same old story about their depression and prescribed powerful anti-depressants to "cure" them. These drugs may help temporarily. But that’s it. And if you aren’t told what depression really is, how can you defeat it? Russell L. Blaylock, M.D - "Anxiety is a major problem with depression, and vaccinations will greatly worsen the condition. In fact, vaccination, especially multiple vaccinations, will maintain the brain in a state of inflammation that will be self-perpetuating, because the excess release of glutamate in the brain, as well as glutamate in the diet, will further enhance microglial activation and excitotoxicity." Michael B. Schachter, M.D. - "Psychotropic drugs are not the complete answer to the critical and growing problem of depression in this country. In fact, I believe that in some ways they contribute to it." Dr. Med. Heinrich Kremer of the Niedersachsen and Schleswig-Holstein clinic, specializing in medications of the states Berlin, Bremen, Hamburg, describes in detail the effects of the drug Ritalin in the brain and to introduce alternative, Ritalin-free therapies for restless children. No conscientious doctor will prescribe Ritalin after studying this article. Michael B. Schachter, M.D. - "As I sit down to write What Your Doctor May Not Tell You About Depression , the Food and Drug Administration (FDA) has just approved another antidepressant. The name of the drug doesn't matter; it joins the ranks of about one dozen others already on the market. Presently, more than two dozen additional antidepressants are under development, according to the trade group Pharmaceutical Research and Manufacturers ofAmerica. And as you sit today and read this book, another antidepressant has been, is being, or soon will be released to the market, to be followed by others currently in research-and-development or trial phases. While the good intentions of those who work so diligently to find remedies for the millions of people who suffer with depression may be commendable, I remain largely unimpressed. Why? Because regardless of the number of antidepressants introduced to the market or when they appear, the bottom line is that psychotropic drugs are not the complete answer to the critical and growing problem of depression in this country. In fact, I believe that in some ways they contribute to it." Julian Whitaker, M.D. - "As much as 70 percent of all visits to family doctors or general practitioners are related to chronic stress, high blood pressure, and stoic stress. Stress can be associated with both good and bad circumstances — getting married, having a baby, going through a divorce, losing a loved one, selling a home, or retiring — but none of these situations is inherently stressful. It's your response to a situation that defines it as stressful. While a little stress can be useful in keeping us on our toes, problems arise when stress becomes chronic. Eventually, chronic stress takes its toll on body and mind, impairing physical and mental health." by Vamik D. Volkan, M.D. Stress From Violence, Disaster Can Linger For Years. People who survive natural disasters or severe violence are at high risk for suffering years of post-traumatic stress disorder. In 1988, thousands of Armenians were devastated by a severe earthquake; in that same year, political violence erupted against ethnic Armenians in neighboring Azerbaijan. Both countries formed after the break-up of the Soviet Union. In a study of 78 Armenians who experienced either of these traumas, researchers found that both groups had similar, long-term symptoms of post-traumatic stress. First widely recognized in veterans of the Vietnam War, post-traumatic stress disorder is now recognized to be a problem in the larger population. Anyone who survives intensely traumatic circumstances may show its signs and symptoms -- including withdrawal from others, flashbacks, and feelings of helplessness. The researchers looked at post-traumatic stress in three groups of adults whom they had first studied 3 years earlier. In one group, subjects had experienced minor earthquake damage, but were exposed to "graphic depictions" of destruction in other parts of the country. In another group, people had their lives directly threatened by the earthquake and had witnessed the death and destruction it caused. Subjects in the third group had experienced persecution in Azerbaijan, suffering threats to their own lives and witnessing the torture or murder of family or friends. 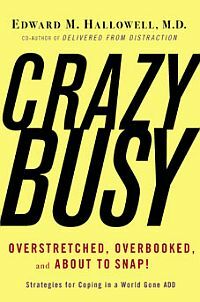 CrazyBusy: Overstretched, Overbooked, and About to Snap! Edward M. Hallowell M.D. 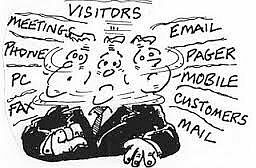 - "The rush, the gush, the worry, and the blather (which also includes clutter)" into allies, so that one can have the things one wants with the speed, volume and emotional energy of the crazy-busy lifestyle. The roadmap Hallowell offers is helpful; that is, if one can manage to pick this book out of the never-ending stream of stimuli and find the time to read it." The adrenal glands function in the body to help handle stress. They act as our body's "shock-absorbers." When the body encounters stress or has low blood sugar, the adrenal glands release the hormone adrenaline into the blood. This hormone immediately increases blood pressure, stimulates the heart, and relaxes the muscles in the lungs. Adrenaline is ideally supposed to be released in situations where "fight or flight" decisions are being made. In modern society, however, high stress levels cause adrenaline to constantly circulate in the body. This can contribute to nervousness, anxiousness, and insomnia. Exercise, dance, walking, and high-energy work help diminish the levels of adrenaline in the blood. Increased levels of these hormones and their metabolites, and other stress-related chemicals left circulating in the blood awaiting removal, can leave a person feeling anxious, irritable, tense, and nervous. The multiple stresses of modern day life combined with the standard American diet, along with the consumption or use of sugar, caffeine, alcohol, tobacco, and prescription or recreational drugs can over stimulate and place stress on the adrenal glands. When the intensity and frequency of stress overcomes the level at which a person can cope with such stressors, something is bound to break down. At this point, people become more vulnerable and susceptible to colds, flu, and infections. People exhibit adrenal gland stress or exhaustion in a variety of ways, some of which can even seem conflicting. Some people exhibit anxiety, nervousness, hyperactivity, or insomnia, while others experience only fatigue or low energy. Some unfortunate individuals experience both. Other signs include overreacting to noises or sudden stimuli, or a craving for salt. One of the most obvious signs of adrenal fatigue is when a person wakes up tired even after a good night's sleep. Because adrenal fatigue and exhaustion have a negative effect on the immune system, these are often the individuals who catch every cold and flu that goes around or are sick during every flu season. The stress from deepening debt is also becoming a major issue resulting in severe depression and stress-related illnesses. Almost three-quarters of Americans are experiencing financial stress at least some of the time, and nearly a quarter of us are experiencing extreme financial stress, according to a study released today by the American Psychological Association. Addictive habits and superficial attempts to change one’s lifestyle may not work in severe cases of anxiety or stress because they fail to address the root issues that lead to symptoms. Homeopathy is one of the best ways to address underlying issues and ultimately remove stress and anxiety, which in turn brings physical health if the remedy is prescribed professionally. 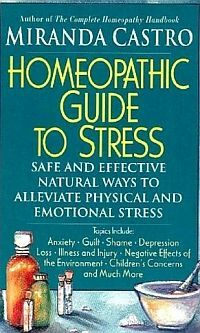 Homeopathic Guide to Stress presents inexpensive, easy-to-use ways to self-treat its symptoms and to handle its causes. From nervousness and anxiety to the effects of caffeine, allergies, and long hours in the workplace, we’re bombarded with emotional and physical stress every day. Written in a clear and engaging style, It offers an introduction to homeopathy, with a focus on stress. For more than four dozen specific emotional states or physical causes of stress, Miranda Castro suggests several homeopathic treatments, with clear instructions on how to choose the most appropriate solution. These remedies help you cope with current or recent stressors, and also can be taken as preventive measures. A comprehensive section describes each remedy in detail and each entry gives a clear picture of who should use It, how, and why. Castro also provides several case studies and practical advice on avoiding and dealing with stress. Homeopathic Guide to Stress Is an easy-to-understand guide to safely and effectively treating the effects of stress at any time of life, from infancy to old age. Can Stress and Depression Make you Feel Tired? In the United States and European Union 1 out of 4 persons suffers from tiredness. Why are some people always so full of energy – while you try everything you can think of and still feel tired all the time? Well, the answer is simple – you are probably doing something wrong. The problem is that there are so many different things that can make you feel tired – and while some might be obvious, I'm sure others will surprise you… If you would like to know why you are so tired and how to get the energy back into your life. Most people do not get enough sleep, and the sleep they do experience is often of poor quality. Substandard sleep causes increased cortisol levels, poor memory and contributes to weight gain, all of which adds to one’s stress level. Obtaining enough sleep on a regular basis is essential to stress reduction. Regular exercise also reduces stress by reducing cortisol and releasing the body’s natural endorphins. Cut down or eliminate caffeine, alcohol and nicotine as these contribute to stress on the nervous system and adversely effect sleep quality. Increase dietary calcium and magnesium, which are essential nervous system nutrients. Are You Feeling Emotionally Stressed ? Emotional Freedom Technique (EFT) is a therapeutic approach to discharging excess emotional distress and liberating one's natural growth process. It has its roots in ancient Chinese medicine and the modern science of Applied Kinesiology. EFT is the most effective therapy that I know of to rapidly and efficiently resolve the physical consequences of severe emotional trauma. All, not some, but ALL negative emotions are due to disruptions in one's bioenergy system. EFT was put together by Gary Craig and is a derivative of Thought Field Therapy that was developed by Roger Callahan. TFT was my first introduction into energy medicine which I learned in 1998. However, EFT is much more streamlined and seems to achieve fabulous results by balancing one's energy meridians while saying positive affirmations about the addiction in question. EFT is psychological acupuncture without the needles. It works by inputting kinetic energy (tapping) onto specific acupuncture meridians on the head and chest while actually activating the brain circuits that are involved in the energy disruption by thinking about the problem. Combining the above with a positive affirmation seems sufficient to disrupt the field that is created from the emotion and its consequence on one's physiology. EFT centers around the profound effects of the body's subtle energies using the theory that "the cause of all negative emotions is a disruption in the body's energy system." Accordingly, EFT is an emotional form of acupuncture except that we don't use needles. Instead, we tap with the fingertips to stimulate certain meridian energy points while the client is "tuned in" to the problem. The subtle energies that circulate throughout the body have been largely ignored (until recently) by western scientists. As a result, our use of them for emotional and spiritual healing has been sparse at best. With EFT, however, we consider these subtle energies to be the front running cause of emotional upsets. As a result, we generate results that are FAR beyond those of conventional methods. Even a cursory review of the case histories on this web site will reveal that. EFT is a Doorway to the new Healing High-Rise. It is where a growing number of newcomers to this exciting field get their start. We now have thousands of practitioners using EFT throughout the world. Compared to other techniques, EFT is usually quite gentle and substantial relief is often achieved with little or no pain. This is not true for everyone, however. Some people's issue are so intense that the mere mention of them causes emotional or physical pain. Although truly serious instances of this (sometimes called abreactions) is most likely to occur in seriously emotionally damaged people (best estimate is less than 1% of the population), newcomers to EFT are advised to exercise common sense in this regard and not go where they aren't qualified. This technique is so amazing it is to good to be true. It has been a major benefit for nearly all of the patients we have trained in it. Most people who were deeply saddened by this terrorists attacks had enormous levels of peace and reassurance after having the technique performed. Called the 'anti-stress mineral,' magnesium aids in relaxing nerves, relieving tension, assisting digestion, activating enzymes important for protein and carbohydrate metabolism, and modulating the electrical potential across all cell membranes. Magnesium has a calming effect on the nervous system and is frequently used to promote good sleep. Nervous fatigue, stress, depression, tics and twitches, tremors, irritability, hypersensitivity, muscle spasms, restlessness, anxiety, confusion, disorientation and irregular heartbeat all respond to increased magnesium levels. Aman Shah, MD - "It may sound fishy, but researchers say taking a daily fish-oil supplement may boost the effectiveness -- or even replace -- antidepressants for treating depression in some people. In a new study, people who added a daily dose of fish oil omega-3 fatty acids to their regular antidepressant treatment had significant improvement in symptoms, including anxiety, sleeping problems, sadness, decreased sexual desire, and suicidal tendencies. Researcher Malcolm Peet, MD, of Swallow Nest Court Hospital in Sheffield, England, and colleagues found that patients who took the lowest, 1-gram daily, fish-oil dose showed significant improvements on all major measures of depression compared with those who took a placebo. In particular, 69% of the patients who took the 1-gram dose had a 50% reduction in their symptoms, compared with only 25% of those who took a placebo."